Many aspects of the Burke’s presentation yesterday were intriguing. Everything from their Live/Work space to their descriptions of “the red list” for buildings showed that attention to detail at every scale is something that they dedicate their work to. One thing that they mentioned that caught my interest was the Living Building Challenge. It was something I’d never heard of before, and when they mentioned that it was more progressive than LEED I decided to do a bit of research. 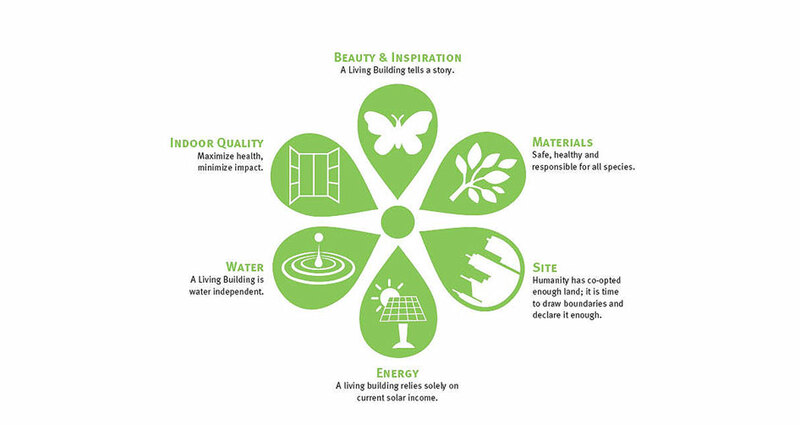 The Living Building Challenge was launched in 2006, and covers buildings at all scales. It is the most advanced measure of sustainability today and it “acts to diminish the gap between current limits and idea solutions.” Projects that achieve this level of performance can claim to be the “greenest” in the world, and while it isn’t always easy to achieve this status through the program, the idea is simple: there are never more than 20 imperatives for a project, no matter the size or scale. It is a cohesive blend of ideas combining architecture, engineering, planning, landscape design, and policy, all of which focus on the set “performance areas”: site, water, energy, health, materials, equity, and beauty. This non-governmental organization challenges a variety of professions. To the design professionals, contractors, and building owners, it is “to create the foundation for a sustainable future in the fabric of our communities.” To the politicians and government officials, it is “to remove barriers to systemic change, and to realign incentives and market signals that truly protect the health, safety, and welfare of people and all beings.” To the rest of humanity, it is “to reconcile the built environment with the natural environment, into a civilization that creates greater biodiversity, resilience, and opportunities for life with each adaptation and development.” The leaders of this challenge recognize that the change they are asking for is extreme, but they believe that there is a limited window of time left to make beneficial changes to our environment and to “realign our ecological footprint to be within the planet’s carrying capacity.” An important component of the Living Building Challenge is that its certification process is based on actual performance, rather than anticipated or modeled performance, so a project has to be operational for at least twelve consecutive months before it can be evaluated. Annesley, I agree that the Living Building Challenge is particularly interesting to further research. While for recent years LEED has been the dominant form of green building construction, it is good to see that there are other options arising as well. I have recently done extensive research on LEED and have found many flaws in the program. For instance, it is possible to become LEED certified without actually making a difference in terms of sustainability. A study done by the Harvard GSD proved that LEED points can be acquired without impacting any part of the environment. As a result, the Living Building Challenge seems to be a lot more successful in the sense that it truly is a challenge, and in order to reach it, it is mandatory that buildings make influential advances and efficient changes and positively impact the environment. I am also interested to research more about it and learn about various projects that have succeeded in reaching the challenge.